Restyling Wine, our 18th September autumn trade tasting, was a tasting with a slight difference, an attempt to refresh wine categorisation and to make people think about different things when they are tasting wines rather than “is this wine typical of the grape variety” or “is it a good example of a wine that such-and-such particular region.” Categories might revolve around sensation/impression, others would focus on terroir or soil type; there were other sections that categorised wines in alternative ways. The main idea was to allow tasters to compare and contrast, to understand wine not in the vague global sense of perceived typicity, but to examine the juxtapositions within the local category. Or, to put it another way, rather than making wine fit our simplistic categorisation, we would try to be more provocative and, promote, dare one say, an intuitive tasting approach, which would make tasters interrogate the way they feel about wine. 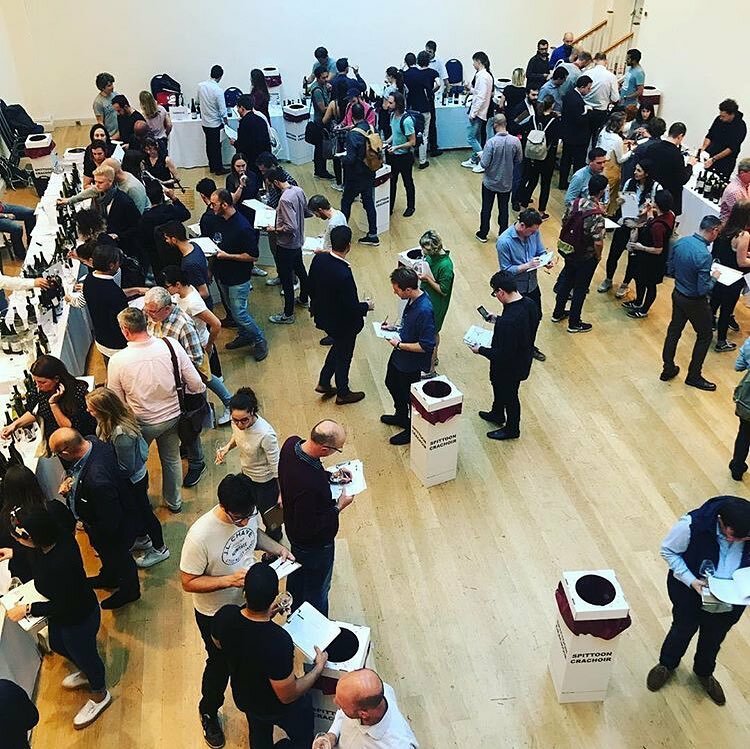 Categories might revolve around sensation/impression, others would focus on terroir or soil type; there were other sections that categorised wines in alternative ways. It was a tasting to promote diversity. To instigate an understanding that wines speak differently on different soils, that grape variety is only part of the story. That a winemaking method such as skin maceration for white grape varieties, may yield a very wide spectrum of aromas, flavours and wine styles. For all the sheer variety on how, the message was a simple one. We were opening wines that we ourselves would love to bring to a party, or to drink for ourselves. Prospecting tasters might dip in anywhere, although there was a vague method to the madness. The first run of tables detailed a progression of wines that crackled with the zip and verve of pronounced natural acidity. The juxtaposition of Orange/skin contact wines and Pots and Eggs was also logical in that there were numerous crossovers. The opening category was called “Light”, an ironic reference to one’s typical perception of alcohol in wine. Below 12% is just a number, not a designation of flavour impact. The Burja white (11%) from the indigenous Vipavan Zelen grape – was anything but light-bodied, acquiring its rich, mouth-coating texture from fermentation and ageing on the lees in beautiful cement eggs. The 2014 Racines Blanc from Claude and Etienne Courtois ferments slowly and is aged for several years. The wine was incredibly complex, building and building on the palate, possessing incredible length and purity. Momenti Mori’s Nosiola, weighing in at a deceptive 9.3%, was a rich bitter-lemon mouthful of musky skin-contact interest; Judith Beck’s Welschriesling Bambule!, meanwhile, expressed the complexity of the terroir, and was given extra oomph by its short time macerated on skins for added phenolics. There were reds too to enjoy – the seriously Syrah from Romaneaux-Destezet, its saline granitic edge underpinning the blackcurrant and olive fruit, the juicy Dosset from Principiano, a kind of Dolcetto Nouveau (11%), and the wonderful PolOpuesto Que Grande Sos Criolla, pale, murky, Poulsard-stylee, Argentinean native grape mishmash. “Crunch” referred to those wines that make your mouth water without even tasting them! When you start with Dominique Belluard’s glacial Gringet Les Alpes, proceed through Dominique Lucas’s Chasselas Face au Lac (like an alpine stream coursing across your tongue) onto Jean-Bernard Larrieu’s crystalline old vines Jurançon Evidencia, the pool of anticipatory drool will inevitably form at your feet. Also to be found in this section, the lyrical Blue Dragonfly from Andreas Tscheppe, elderflowery Sauvignon compote in a glass, Les Cailloux du Paradis Romorantin, all with its scything acidity and nervous energy, and Kelley Fox’s Freedom Hill Pinot Blanc with its steely apple fruit and impressive mouthfeel. Two reds brought up the rear: Bow & Arrow’s Air Guitar, oozing lip-smacking sappy red and blue fruit, and Momenti Mori’s The Incline, a Syrah to have the last word on crunchiness. 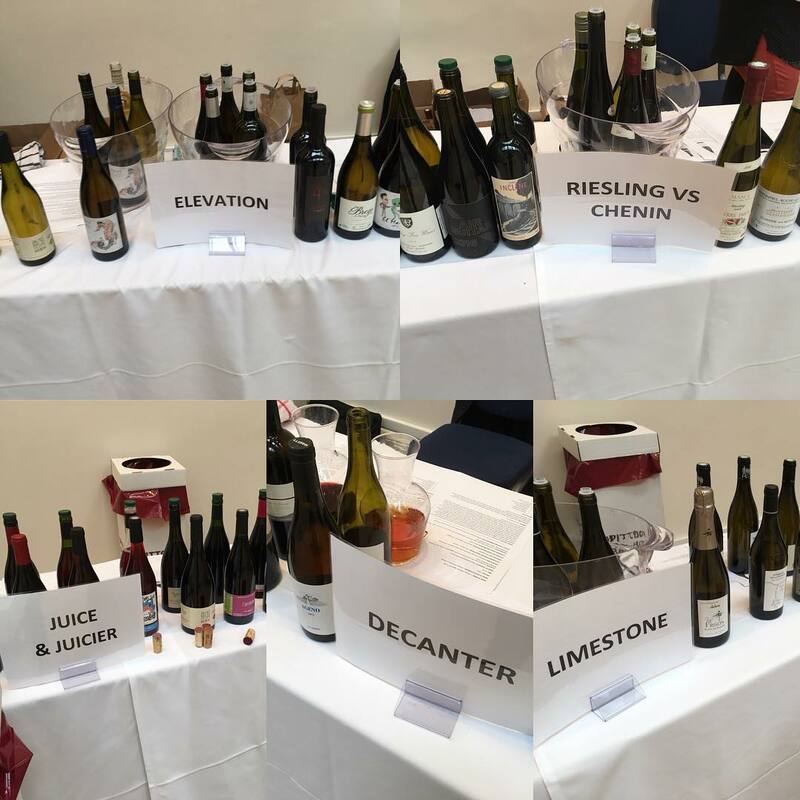 The next category, called simply “Riesling versus Chenin”, alternated some of our favourite examples of each variety. Skin contact Riesling float your boat? Try the magnificent Matthias Warnung Feldstuck Riesling from Kamptal. A walk on the wilder side of Chenin would have to take in an encounter with Gilbourg from Benoit Courault (think just ripe apples with notes of heather-honey and crushed stone), whilst the Savennieres Roche-aux-Moines was a more military style of straight-backed dry Chenin. 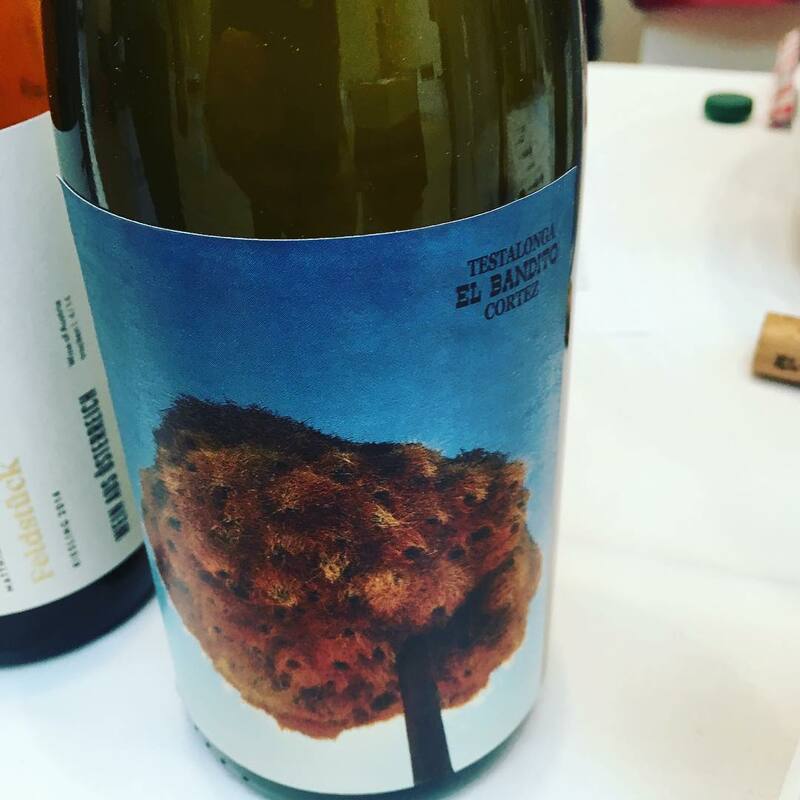 Special shout for Testalonga El Bandito Cortez 17 Chenin (#labellove) and the Riesling Grand Cru Schlossberg from Christian Binner with its delicate nose, piercing citrus fruit and coiled spring tension. One of my wines of the tasting. “Sea and Sand” jumbled maritime climatic influences with soil types. Here were Muscadet a-plenty, Vinessens’ El Carro Moscatel, a cheeky skin-contact “white” from wee bush vines nestling on sand dunes adjacent to the Med, a Picpoul for happy oystercatchers, Zidarich’s delightfully understated herb-flecked Vitovska, De Bartoli’s nifty and twangy Grillo, and the Bandol Blanc from Chateau Pibarnon, a beautiful amalgam of Provencal grapes. “Elevation” featured wines from vineyards located at 800m+ above sea level. For example, an inky natural Malbec from Argentina (1,200 m), a Godello-dominated Bierzo Blanco from Mengoba, a mouthwatering Carricante called Vino di Milo from I Vigneri, and a Valle d’Aostan Blanc de Morgex from La Cave du Vin Blanc, with grapes sourced from one of the highest vineyards in Central Europe (1,300 m). “Limestone” mined a rich seam and gloriously cool and shimmering whites (and a couple of graceful reds). 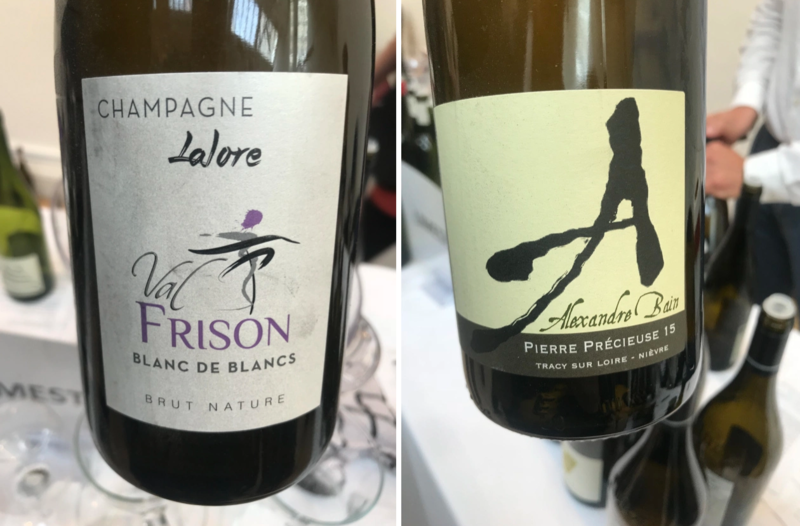 Highlights from this section included the Lalore Blanc de Blancs Val Frison, Alexandre Bain’s Pouilly-Fumé Pierre Precieuse, the blistering Clos Romans from Thierry Germain, Dominique Derain’s Bourgogne Blanc and La Coulange Vineuse Generique from Vini Viti Vinci. Although expressing their virtues according to their specific location and the nature of the vintage, many tasters found that this section had a powerful identity, that the wines were linked in more ways than not, that they shared a similar lift and energy on the palate. “Volcano” explored wines from vines on basalt, red sand, Jory soils or originating from vineyard proximate to volcanoes. Hetszolo Tokaji was Furmint from an organically farmed vineyard on the mountain, Vino di Anna Qvevri Rosso from a vineyard on Etna, is fermented and aged in Georgian qvevri. The Nerello grape interprets the volcanic terroir powerfully. I Vigneri Vinudilice is a lucid pink-tinged field blend of white and reds grape from a vineyard at 1,200 m on the footslopes of Etna, a tonic beauty, the balsamic-smoky Maupertuis Pierres Noires from basalt-rich soils in Auvergne (Gamay with a touch of Noirefleurien), and Kelley Fox Momtazi Pinot Noir was in fine fettle, red fruits and cool earthiness delivered on a backbone of minerals. Onto “Garrigue”, an all-red group of wines that sang of Provençale smells and sensations: clumps of bay, thyme, rosemary, arbutus, lavender read also macchia and fynbos, and any wines from vineyards imprinted with their environment of wild bushes and rocky outcrops. Think of a hot southern sun roasting wild herbs and somehow this is transmitted subtly in the wines in bouquet des garrigues inflection. A thyme-and-violet-scented northern Rhone Syrah from Romaneaux-Destezet – Saint-Joseph Cessieux Rouge; meaty menthol-laden Bandol from Domaine Tour du Bon; the granite-inflected Intellego Syrah from Swartland with a delicate dusting of dried herbs; Mas de Daumas Gassac Rouge with its subtle suggestions of bay and rosemary woven around the graphite Cab Sauv dark currant fruit and the Sardinian Monica di Sardegna Nibaru (the local name for the Spaccasassi bush) from Alberto Loi, with its fresh red and dried flower aromas and limpid berry fruit, were united by this sense of heat, rock, flower, wild herb and spice.